The coming week will mark the birthdays of two of my favourite grandparents, who made a huge impact on my life growing up and still do to this very day. They are no longer alive but I see a little bit of them in everything I do. I remember that joy for life I had and that they nurtured every time we visited them. They let us make-believe till lunch and then make-believe some more till it was time to wash away the dirt. That was true freedom. That’s what I will always carry with me. I don’t think I grieved for their deaths when it was all still raw. I tried but I was too young for my grandfather’s death and my grandma’s passing was very surreal. Like the type of thing that wasn’t supposed to happen to people you knew. Except it does. When I find myself sitting in the quiet spaces of this life I am sometimes overcome with nostalgia and yearning for that feeling of joy we got by mixing mud with water. I miss that careless abandon. It’s the same life we pieced together by digging into my grandma’s cupboards and trying on all her clothes and jewellery, deliberately making her open her trunks so we could take some home with us. She always let us. I don’t know for certain how grief is supposed to feel but there never was any template to begin with. All I know is that I’m a different person because of them. They gave my sisters and I love when we didn’t even know we needed it. They also were the first to show me this fear of losing someone I loved. They weren’t perfect but they gave us the perfect mother. I wish they were here. The chickpeas in this recipe can be made a day ahead. Same with the beets. Just keep them separate and toss them together right before serving. Most important note: Have fun. There is no other way. Toss the chickpeas, herbs, pepper flakes, garlic, onions, lemon juice and olive oil in a medium-sized bowl. Let in sit in the fridge. Heat a charcoal grill to medium-high heat. 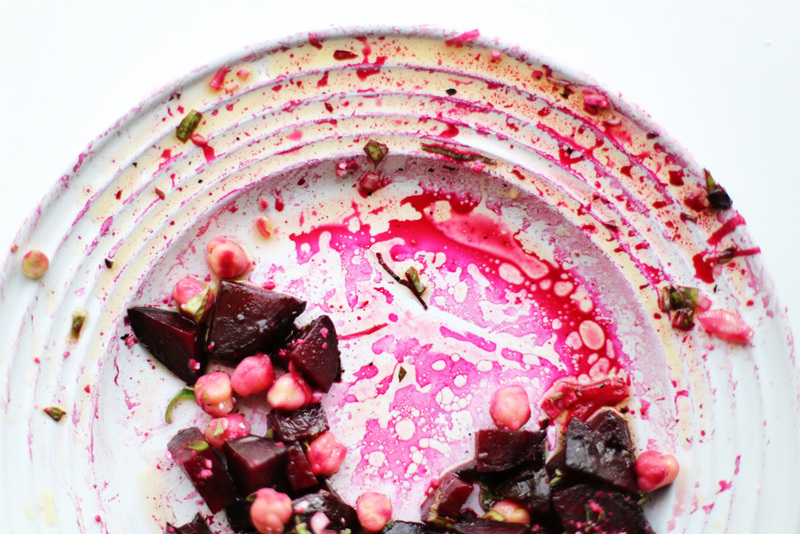 Toss the beets with the olive oil, salt and pepper and place on the hot grill for 30 minutes. Cover the grill. Turn the beets every 10 minutes to char evenly on all sides. At the last 15 minutes of cooking, place the halved orange on the grill. The beets are ready when a pairing knife runs through them without resistance. The orange is ready when it’s charred and fragrant. Let the beets cool and then peel the skins off them using either your hands or the back of a pairing knife. Cut the beets into wedges or cubes depending on how big they are. Place them on a serving platter. Toss the chickpeas into the mix and squeeze the charred orange juice over it all. Add more fresh herbs and top with feta, if using. If not, just sprinkle more salt, if required. I love reading your words about your grandparents. I lived in Australia when I was small, very far away from any of my grandparents. I’ve only met the Indonesian side of them briefly a few times, and my Spanish grandmother I didnt meet until I was a teenager (and she’s still up and about at 96!) I wonder if we had been closer to them when I was small, if I would be a different person now. I’m trying to think if I’m any different and the only thing that comes to mind is that I still try to hold on to that innocence I had at that age. We used to play so much and they told us the best stories. Like you, all my cousins also missed out on growing up close to their grandparents so my sisters and I feel incredibly lucky. Thank you for reading, Sofia. Also when I was in India I realised my mother follows you on instagram!! Hahaha I don’t know how that happened. Cute, it’s like my mum’s instagram! <3 this post. Beautiful words. And I love the photo holding the beets! Thank you, Amber. I must say I am soooooo happy to see you in my blog comments again. <3 We should hang out and eat sometime. I love the beautiful, nostalgic stories that come with the amazing food you write about. Everything you say and do has so much heart. JANE! You know I feel the same about your work.. Thank you. just signed up for the newsletter, so excited!